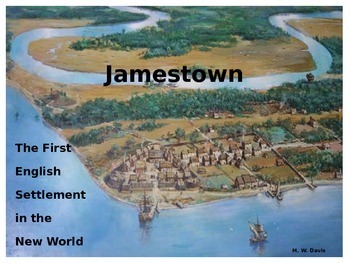 Jamestown: America's First Permanent English Settlement - REVISED!!! 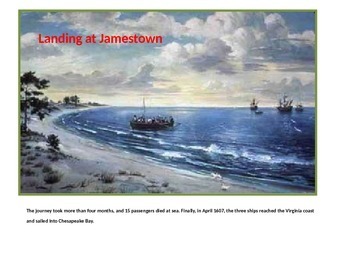 This powerpoint is the story of Jamestown, America's first permanent settlement. It uses words and colorful pictures to tell the story of the trials and tribulations of our country's first settlers. It will definitely keep the interest of the Upper Elementary/Middle Schooler! NEWLY ADDED!! Eleven slides with assessment questions that the entire class can take together right from the document camera. Assessment that the teacher can copy and use to test their students' understanding of the main concepts from the selection individually. Answer key included. 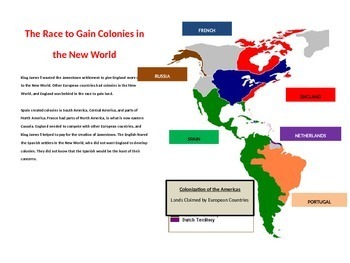 This powerpoint is all a teacher needs to teach a thorough lesson on the settlement of Jamestown. You gotta have this one!!! !